Q: Please help us plan the amount, dimensions and placeÂ­ment of furniture for our new conÂ­dominium in Florida. 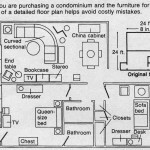 I have enÂ­closed a floor plan. We like to watch television in the living room and master bedÂ­room and plan to use the other bedroom as a guest/sitting room with a pull-out sofa-bed. Also, we will need to have a desk someÂ­where. Any advice you care to offer will be very much appreciated. We have to purchase everything new, and mistakes would be very costly. A: Sometimes when you're starting from scratch, it can be more confusing than if you alÂ­ready owned a few things that you knew you wanted to use. 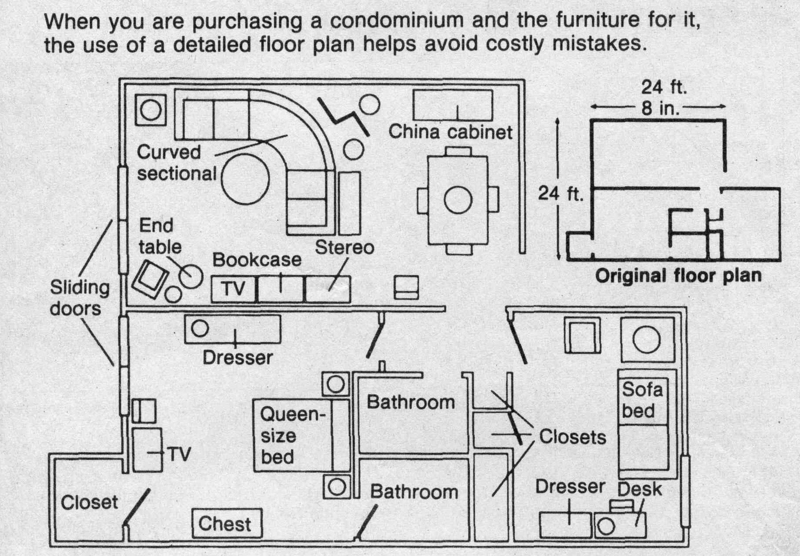 Having a detailed floor plan is definitely the way to approach it. In your large living/dining room, I would visually divide the two areas with a large, curved sectional sofa. The sectional will also take advantage of the view out your sliding glass doors. I graphed in a curved sectional sofa because I feel that it softens the hard geometry of the room and also provides a space for a mirÂ­rored screen and some plants â€” real or silk â€” behind it. A mirÂ­rored screen would not only be an attractive accent but would reflect the light from the -sliding glass doors at the end of the room. A 60-inch console table behind the love seat portion of the sectionÂ­al can accommodate a lamp, which will serve both areas and also be useful when entertaining. An end table with a lamp at the far end of the sectional and a comÂ­fortable chair with a standing lamp and round end table complete the seating and provide well-balanced light. A 36-inch round coffee table works well with the curve of the sectional sofa. I would place three, 36-inch wall units together, on the wall opposite the sectional. They balÂ­ance the weight of the sectional in the room and provide a convenient spot for your television, books, steÂ­reo equipment, plus space for addiÂ­tional storage. A 36-inch by 60-inch dining table, with additional leaves if deÂ­sired, is appropriate for the space. A table this size will leave adequate room for people to move freely around it. In addition, the table matches the scale of the love seat and console table. A tall china cabinet on the side wall of the dining area would proÂ­vide both storage and display space. I would buy a cabinet with an interior light and glass shelves. It's very effective and provides a light source at the far end of the room. You may wish to purchase six chairs. Four can be grouped around the dining table, a fifth placed next to the wall units and the other chair can serve double duty in the master bedroom. ObviÂ­ously, these last two can be pulled up to the table when they are needed for extra seating. In the master bedroom, I placed the bed on the adjoining bathroom wall for a couple of reaÂ­sons. If you put it on the far-side wall, it would not only be too crowded with the swing of the closet door, but the traffic pattern for dressing would be very cumÂ­bersome. If the bed were placed straight ahead of you as you walked into the room, you would virtually fall over it, and it would block the doors as well. Placing the bed where I have it is the best of all options and takes advantage of the view out the doors. An ideal spot for the television is opposite the bed, and the extra dining room chair next to it would be useful for dressing. The long, low dresser does not block either the light or the view upon entering the room, and the high chest works well on the far wall. In the guest/sitting room, the window wall can accommodate a 72-inch sofa bed with an end table and reading lamp. A chair, perpenÂ­dicular to it, creates an attractive conversational grouping. With this arrangement, you are also able to open the sofa bed without moving anything. When the bed is in use, you will have almost 3 feet of walk space beÂ­tween the end of the mattress and the door wall. I would put a desk next to the window to take advantage of the natural daylight, and place a coorÂ­dinating dresser and mirror next to it for your guests' convenience. It is hoped that these furniture layouts will accommodate your needs and be to your liking.